(CNN)Small turtles may be cute but they are making people sick. That was the warning from U.S. federal health officials on Wednesday. Between January 2015 and April of this year there have been four separate multi-state outbreaks of salmonella associated with touching turtles smaller than four inches long. In all, 133 individuals in 26 states have become sick. Thirty-eight of those individuals were so ill they were hospitalized, according to the U.S. Centers for Disease Control and Prevention. Numbers are expected to rise. 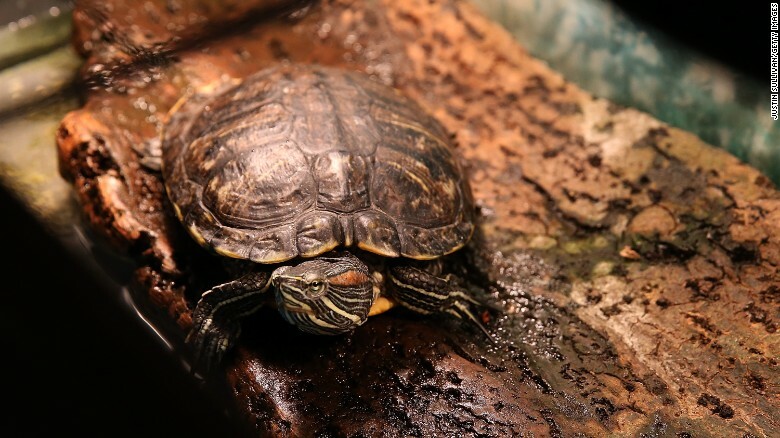 "The outbreak is expected to continue at a low level for the next several months since people might be unaware of the risk of Salmonella infection from small turtles," the CDC said in an investigation update detailing each of the four outbreaks. The agency is working with the U.S Food and Drug Administration (FDA), U.S Department of Agriculture (USDA) and other federal entities to investigate the outbreaks. "Initial investigations have identified four turtle farms in Louisiana as potential sources of the turtles linked to these 2015 outbreaks. Pond water testing from the four farms resulted in the identification of additional non-outbreak Salmonella isolates," the World Health Organization (WHO) said on its website. The animals often carry the bacteria on their skin and shell although they do not get sick themselves. Children, for example, like to put their hands in their mouth so they become infected by touching a turtle or its habitat and not washing their hands. Symptoms begin 12-72 hours after exposure to the bacteria. They include diarrhea, fever and abdominal cramps, but most people feel better in four to seven days. Is your pet going to make you ill? Children under age 5, adults over age 65 and individuals with weakened immune systems are most at risk of developing severe salmonella infection. Forty-one percent of the ill individuals in this outbreak are under age 5. The youngest patient is aged one and the oldest is 78. The FDA banned the sale of these animals in 1975, but outbreaks like this one continue to occur. They ask pet store owners not to sell the reptiles, to wash their hands thoroughly after touching reptiles and all other animals and not to clean aquariums in a sink used for food. Last month, WHO said reptiles exposed to salmonella may have been exported internationally and asked for countries that import pet reptiles and amphibians to be on the lookout for infected animals. I think we all need to do better about washing our hands after handling reptiles. I know I don't wash my hands enough but I'm doing so much more often in the last few months. Anyone know how long a reptile will be a carrier of Salmonella? Is it a life time thing or something they get over in time? I keep fish and reptiles both. Doing some checking looks like they carry salmonella for life, even if they don't show signs.